I am a tad bit on the short side which means I have had to hem every pair of jeans that I have ever owned. So I thought I would share a few tips that I have learned over the years. The key is taking the time to press the hem and the seam allowances before starting to stitch. It may seem like unnecessary work, but it will be worth it! 3. Cut the jeans 1” longer than the marked hemline. 4. Cut away as much of the side seam allowances as possible. 5. Press the bottom up 1”. Use a clapper to set the creases. 6. Unfold the hem and fold the raw edge just shy of the crease, and then fold up again. 7. Press again using the clapper. (Press with steam and then immediately place the clapper on top of the seam and exert pressure on the clapper. 8. Take extra time pressing the seams. Clip a wooden clothespin over the seams. Leave the clothespin in place until ready to stitch. 9. Attach Jeans Foot #8/8D to the machine. 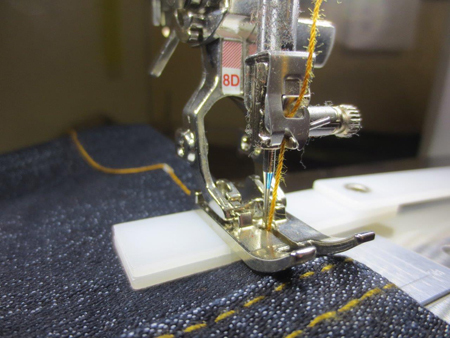 This straight stitch foot is specially designed work with a large Jeans/Denim needle and prevent it from breaking as uneven layers pass under it. 10. Lengthen the stitch length to match the current topstitching. 12. 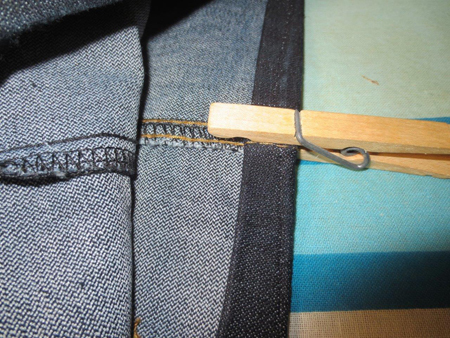 Match the color of the thread to the topstitching on the jeans. 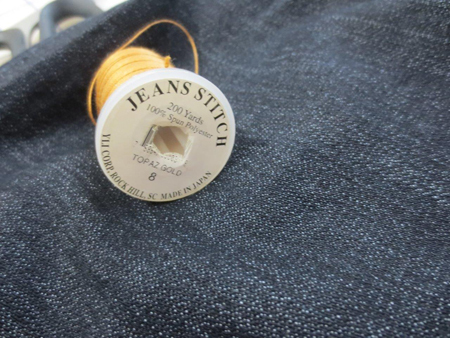 I am particularly partial of YLI’s Jeans Stitch Thread in Topaz Gold for the thread. It looks good with most of my jeans. There is also a color called “Blue Jean Gold,” which is a little brighter. 13. 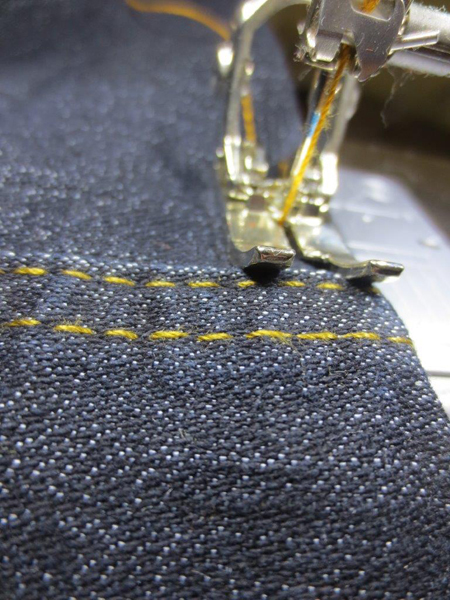 Slide the leg opening over the freearm of your machine and start stitching an inch or two beyond the inside seam allowance. 14. 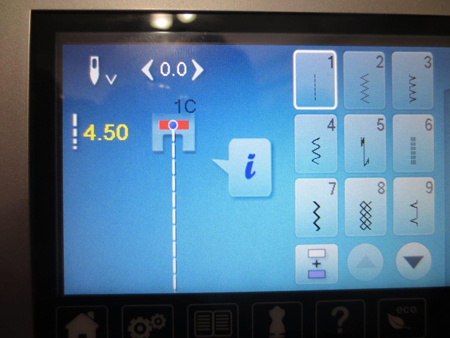 Set the needle to stop in the down position if your machine has that capability. 15. With the needle down in the fabric, stop and raise the presser foot when you come to the thick seam. 17. 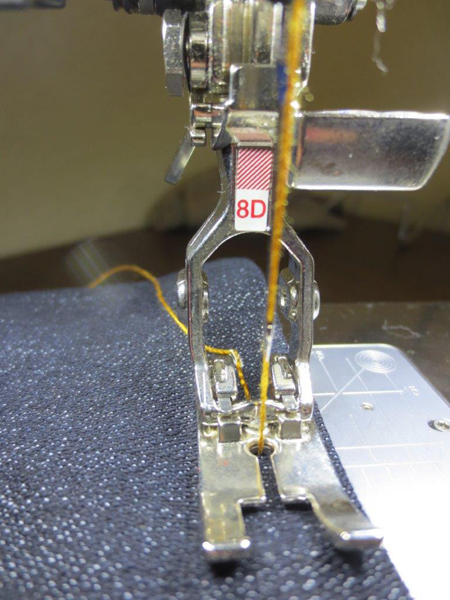 As you start “downhill”, exert pressure on the tip of the toes with your finger as you sew. 18. Continue stitching, overlapping two or three stitches over the beginning stitches. 19. Pull the needle thread to the back and tie off. 20. Wear your newly hemmed jeans proudly! They look great! I have had a Bernina 930 for years now and never knew that I had a jeans foot. Duh! I just found it recently. I have not had the opportunity to use it yet, but am looking forward to not breaking anymore needles when hemming jeans. Thanks for the tips on hemming jeans. Especially the on with the “hump jumper”. I don’t recall having one, but will use the needle pack from now on. Hi mcenerny, a “clapper” is a wooden tool used to crease a pressed seam. They come in different shapes and sizes, and can be used to press down on a freshly ironed seam to set the crease, or as the name suggests can be “clapped” down on the freshly pressed seam to set it. I’ve been sewing all my life and this is really a good idea! Only one question: what’s a clapper? That funny looking wooden thing that I found in my Mom’s stuff that I remember she used when working on wool? Last month I turned a pair of jeans into capris for my 5yo grand daughter. Since I didn’t have any heavy hot pink jeans-type thread, I used three spools of my regular sewing thread in similar bright pink colors and threaded through a top stitch needle. I thought this worked out great, and one would have to look very closely to know the difference. Do you use the same thread in the bobbin?